According to the American Lung Association, the number of cases of pediatric and adult asthma, COPD, and cardiovascular disease in Pima County amounts to over 200,000. Chances are you know someone who has one of these ailments. By taking the "Healthy Air Is In Our Hands" Drive-Less pledge and skipping a commute trip in your motor vehicle each week by carpooling, taking transit or riding a bike instead, you can reduce air pollution about 1,100 pounds a year and help keep the air healthy for those you care about. We will also reap other benefits such as reducing congestion, saving money, meeting new neighbors and colleagues, and getting more exercise. Idling less when in our vehicles will also help reduce emissions. When we drive less we'll all win with cleaner air to breathe, and if you take the "Drive-Less" pledge you might with a $100 gift card! 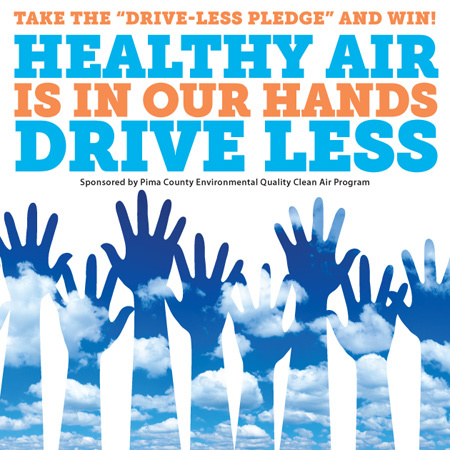 Read the Healthy Air Is In Our Hands Campaign and Contest Rules and then take the pledge for cleaner air. Check out our latest video to learn more ways to keep the air healthy. What Air Pollutants Are Created from Our Vehicle Emissions? A slew of harmful pollutants are created from driving our motor vehicles each day including carbon monoxide, volatile organic compounds, nitrogen oxides, particulate matter and carbon dioxide. To be exact, because of air chemistry associated with the combustion engine, there are about 21.12 pounds of contaminants put into the air every time we burn a gallon of gasoline. Collectively, we drive about 21,000,000 miles EVERY day in Pima County, so taking a drive-less day once a week will make a difference if we each take a turn. By choosing one day a week as a “no-drive day,” we each can save about a half ton of pollution every year. That savings keeps the air cleaner and helps our neighbors, friends, and loved ones stay much healthier. Healthy air is in our hands.